Please contact Jill Ravitch, the Sonoma County District Attorney, and respectfully urge that her office prosecute the owners of Reichardt Duck Farm for cruelty to animals. Request a written reply. Seeing how industrially raised ducks are tortured every which way, including de-billing with burning metal, it is supremely sad to know that the only splashing and abundant water these ducks will ever experience in their lives is the cold, salted electrified water in the slaughterhouse through which they are dragged, face down, to paralyze their bodies for feather release after they are dead. This is how we treat our feathered friends. This is why the word “food,” unless it is vegan, increasingly sounds like – and is – an obscenity. Ducks in Despair is a new video released by Mercy For Animals in October. It reveals horrific cruelty to ducks and ducklings at Reichardt Duck Farm in Sonoma County, California – one of the largest duck farms in the country. Hidden cameras show ducks with severe injuries and illnesses, bleeding wounds, de-billing of baby ducklings, ducks trapped in cage wires and manure pits, ducks having their necks violently broken and their throats cut by workers. The video shows ducks being thrown, dropped, and callously carried by their heads and wings. To watch Ducks in Despair, go to www.mercyforanimals.org/ducks. Ducks are waterfowl. To be healthy, ducks need not only to drink lots of fresh clean water; they need to swim and bathe regularly in water for the health of their skin, feathers, and eyes. 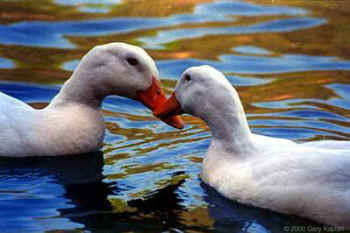 In nature or a sanctuary, ducks rinse their eyes frequently during the day. Deprived of water to rinse their eyes in, ducks develop an eye disease called ophthalmia, or “sticky eye,” in which a yellowish discharge mats down the feathers around their eyes causing their eyelids to stick shut. Untreated, sticky eye can cause blindness. 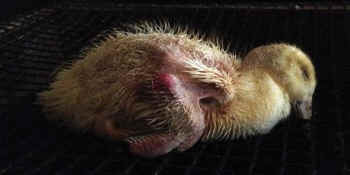 Not surprisingly, sticky eye is a disease of ducks raised indoors, and of course these ducks never receive treatment. We are birds. We are not your "food." Stop torturing us. Go vegan.